You probably feel alive and vibrant today, but one day it’s inevitable you will no longer be here in the flesh. When that day comes, I wonder what you will be leaving behind. A family – spouse, children, grandchildren, maybe great-grandchildren? Assets such as a house, car or other material possessions? Perhaps also intangible assets, like a company? In addition to those things, you will also be leaving behind memories and ideas; I call this your philosophical footprint. Great thinkers all leave their philosophical footprint on the world. Think of any inspirational leader, past or present, that has made an impact on you. They did so by sharing their unique wisdom and ideas – their thought leadership – in a way that resonated and moved you in some way. Did you know that only about 5% of all people manage to fulfil their big dreams and create something really special in the world, something that lasts and helps people for generations to come? So many people intend to write and publish important books, so many people have an ambition to speak out but never do it. We have found that only 5% of all aspiring authors ever finish and publish their books. If you are in that 5% (or want to be), you will know what I am talking about. It’s wonderful seeing people freeing their best ideas and daring thoughts so that they can take others to a new level of thought and action. True leadership is thought leadership, since people are moved mostly by the power of ideas. Take some time today to reflect on what people will remember about you: what you said, how you made them feel and maybe even how you inspired them! Gingerly stepping through life is easy; we all do it. 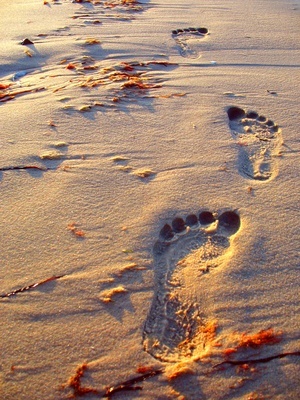 Leaving a lasting footprint doesn’t have to be difficult. You just need to make the choice. If you choose to do it, I’d love to hear from you and help you in any way I can.